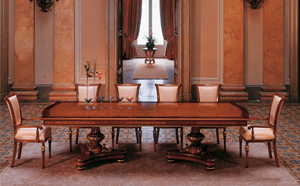 Classic Dining Room furniture including Dining Tables, Chairs, Commodes and Vitrines, with designs prominent in hand inlay. 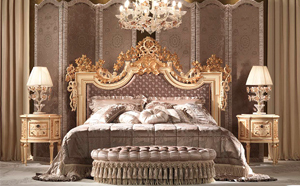 Collection displaying complete Bedroom and Office furniture in various handmade classical styles. 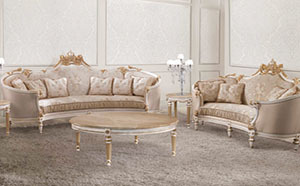 Living Room furniture with strong focus on carved wood designs, available in custom finishes and Italian fabrics. 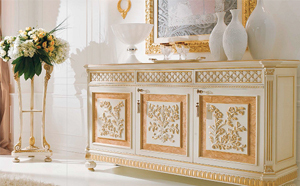 A collection for the complete home, featuring furniture that is hand-carved, hand-painted and delicate in construction. 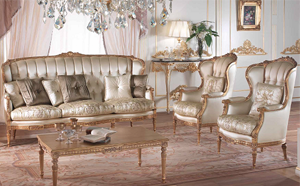 A truly regal collection featuring sumptuous furniture for the complete home. 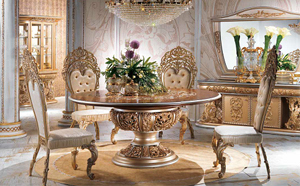 Fine materials such as pearl, gold and silver are used throughout. 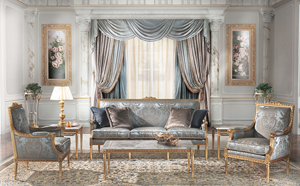 An extravagant collection featuring luxury show-stopping furniture in the most unique styles, emblazoned with crystals, gold and heavy carving. 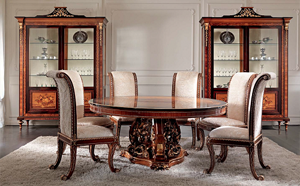 Traditional Dining Room furniture including Tables, Chairs, Commodes and Vitrines in elegant silhouettes, with artfully crafted details. Traditional Living Room furniture including Sofas, Loveseats, Armchairs and Tables in elegant silhouettes, with artfully crafted details. 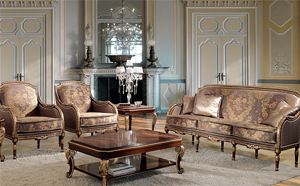 An elegant collection of furniture for the complete home in rich Italian walnut burl wood and warm tones, with soft curved silhouettes. 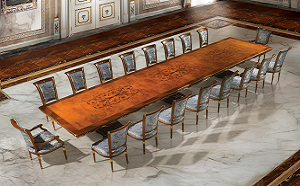 The Edo and Louvre dining collections feature beautifully hand carved designs in tonal ranges from eggshell to antique finish with gold accents. 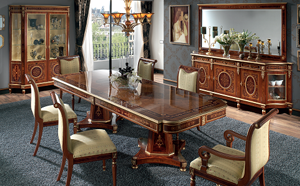 An artisanal Dining Collection made from woods in mahogany and reddish tones, featuring prominent hand cast bronze detailing. 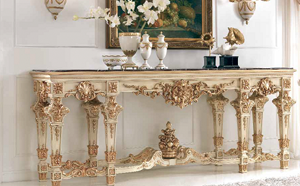 Ornate and intricate furniture for your Entry space, including Console Tables, Mirrors and accent pieces in gold, marble and carved wood.